Worship at Our Father's Lutheran Church! 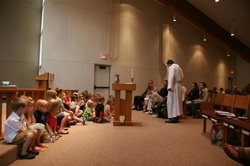 At Our Father's Lutheran, we strive to make sure that the Word and Sacraments are shared with the people of God. In worship, we express our joy for what Christ has done for us, that he died to take away our sins and that he rose to defeat the power of death. Through the Sacrament of Holy Baptism we are united with him in his death and resurrection! In worship we are also reminded that Christ continually renews us through the power of forgiveness of sins in his Holy Supper, in which he shows us his grace and gives us strength, hope, and joy. Through worship Christ's Spirit energizes us to go out into the world to proclaim the Gospel message through Word and action. Traditional service with Liturgy and traditional hymns. Blended service with Christian Contemporary songs led by a small Praise group. 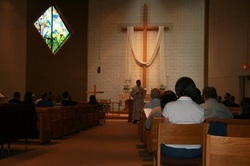 Holden Evening Prayer service during Evening Lenten Worship. Summer Wednesday Evening Prayer Worship. Christ' Table is open to all who hunger to be fed spiritually. We recognize that each of us come to the Lord from different places in our journey with Christ, and we welcome you as Christ welcomes all, openly into God's presence. We celebrate Holy Communion at each service every week. Nursery care is available during all Sunday services during the school year. During the summer the nursery room is available for use. Please feel free to stay with your child. The service is aired over a speaker in the nursery. You can find the nursery room in the Education Wing, Room 105, the last door on the right. Education Hour includes both Adult Education and Sunday School and is held during the school year at 9a.m. Adult education is in the Fellowship area and a wide range of topics are discussed. Sunday School is held in the Education wing for 4-year-olds to 6th graders. Can't Make it on Sunday? Stay in touch during the summer or when your schedule prevents you from worshiping on Sunday. Sunday Sermons are recorded and available online as an mp3/podcast. The audio includes the announcements made during the service. Coming soon. You can keep up with Upcoming Events with the online Calendar. Download the weekly article; Gather & Serve. All guest are welcome. We hope to see you soon.